Posted in FPMT Community News, Rinpoche’s Health – Official Updates and Practices. Even if you recited OM MANI PADME HUM, or even recited OM AH HUM, or even recited just OM day and night, or weeks, months and years. 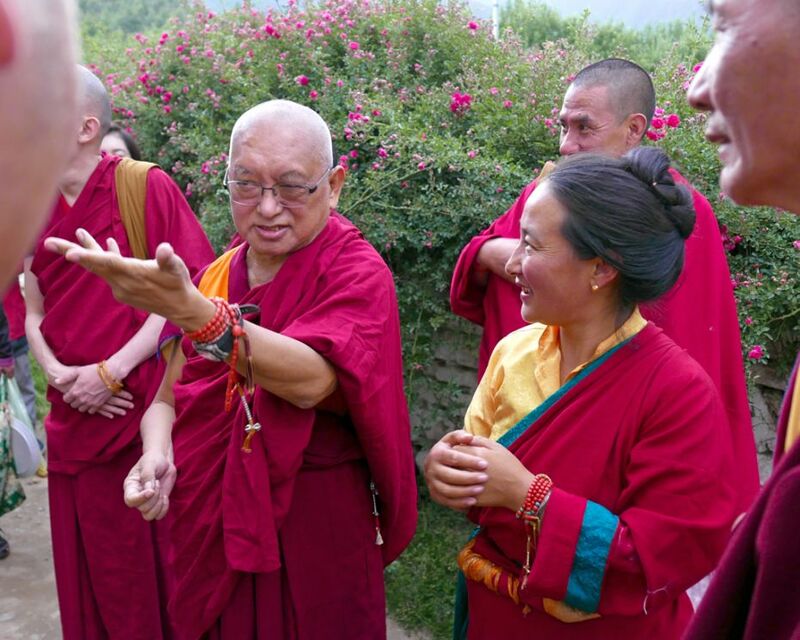 Posted in Announcements, Lama Zopa Rinpoche News and Advice, Rinpoche’s Health – Official Updates and Practices. Lama Zopa Rinpoche with Khadro-la (Rangjung Neljorma Khadro Namsel Drönme) in Bhutan, May 2016. Photo by Ven. Roger Kunsang. Every year Ven. Roger Kunsang, on behalf of the FPMT organization, checks with one of Lama Zopa Rinpoche’s gurus or Khadro-la (Rangjung Neljorma Khadro Namsel Drönme) to determine what practices should be done to help create the conditions for Lama Zopa Rinpoche to have good health for the coming year. Khadro-la has recently advised that some prayers need to be recited, together with the completion of a number of pujas. The prayers Khadro-la advised are the Vajra Cutter Sutra and the Dependent Arising: A Praise of the Buddha (Tendrel Topa). We are requesting everyone to join in and keep track of their recitations of these prayers during the rest of this Tibetan year! At the end of the Tibetan year (i.e., just before Losar 2018) we will ask everyone to send us the number of prayers recited and will offer the total number of accumulated recitations to Rinpoche. It would be very beneficial if all FPMT centers, projects, services, and study groups can arrange regular recitations of these prayers. 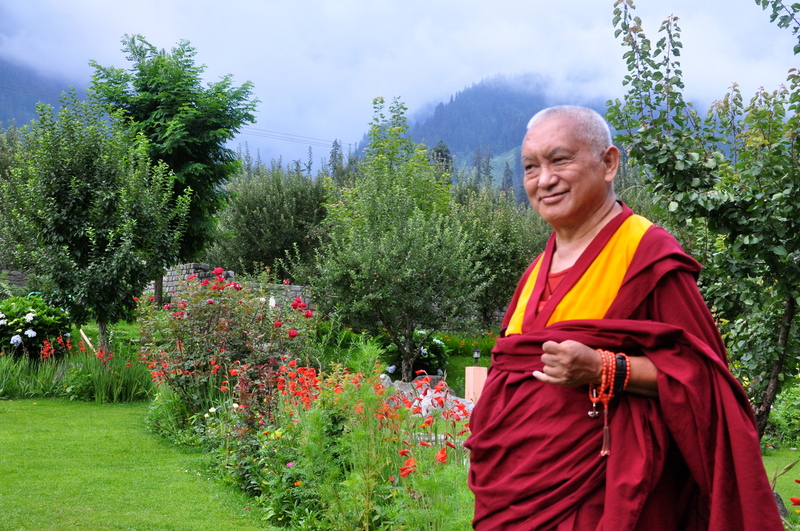 For Kyabje Lama Zopa Rinpoche to always have perfect health and to always be free of obstacles; and for all Rinpoche’s Dharma projects around the world to be highly successful, including all FPMT centers, projects, and services. Offering tsog at the long life puja for Lama Zopa Rinpoche on the last day of the Kopan November course. The five dakinis are also shown. Kopan Monastery, Nepal, December 2016. Photo by Ven. Lobsang Sherab. The pujas advised by Khadro-la will be offered in a number of monasteries every month until the end of this Tibetan year. Any contributions to help cover the costs of the pujas will be greatly appreciated. 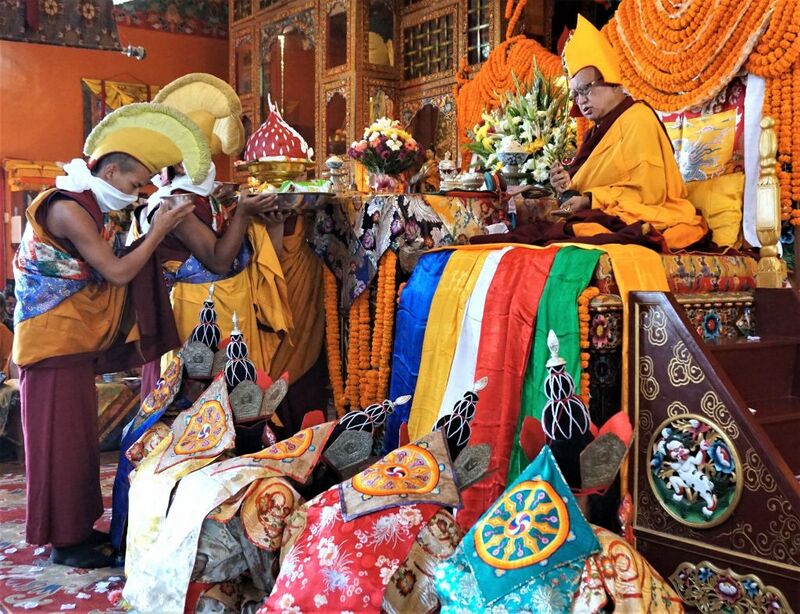 Donations can be made to the FPMT Puja Fund. In addition, there will be an extensive long life puja offered to Lama Zopa Rinpoche at Kopan Monastery, Nepal, on April 23, 2017. Everyone is welcome to attend! 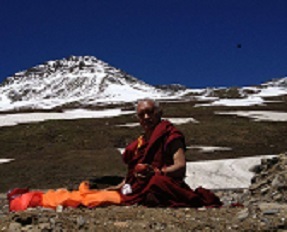 Posted in Announcements, FPMT Community News, Rinpoche’s Health – Official Updates and Practices. The Official Long Life Puja on behalf of the entire FPMT will be offered to Lama Zopa Rinpoche at Amitabha Buddhist Centre in Singapore on Sunday, March 13th (as part of Rinpoche’s teaching event there). The puja will start at 9am Singapore time. During the long life puja Rinpoche will be requested to give teachings on lojong (thought transformation). These teachings and the long life puja will be livestreamed so that all can participate live (or by video later). Help your center to offer prayers and practices for the health and long life of Lama Zopa Rinpoche with a long life puja, and by performing 100,000 tsog offerings with Lama Chopa. Donations to the Lama Zopa Rinpoche Long Life Puja Fund are welcome. Lama Zopa Rinpoche with Khadro-la (Rangjung Neljorma Khadro Namsel Drönme), South India, January 2016. Photo by Ven. Roger Kunsang. Rinpoche is in Sera Je Monastery, South India right now. This morning coming back from the long life puja (offered to the ex-Abbots and Abbot of Sera Je, as well as to the most senior lamas who were around from Tibet and Baxau, and to Lama Zopa Rinpoche) both Geshe Jinpa and Ven Sangpo and I were walking behind Rinpoche and watching with great interest the improvement in Rinpoche’s right leg … the walking action is definitely improving. Then last night I watched as Rinpoche was writing the mantra for putting above the rabbits’ cage here in Osel Labrang. Again you can see improvement. And the rabbits noticed as well. Rinpoche’s blood pressure and diabetes have been ok the past year… and I think there has also been a little improvement in those areas too, although the blood pressure does have a tendency to go up and down. We are no longer requesting and counting the specific practices which were recommended for Rinpoche’s health and long life back in April last year. Thank you to everyone for the extensive suggestions and ideas, and especially for all the prayers and dedication of good karma … to improve our karmic view of Rinpoche. THANKS TO ALL who participated in the practices requested to be done for Lama Zopa Rinpoche’s health and long life back in April this year. On Dec 9th, an amazing total of practices will be offered to Rinpoche as part of the offerings to Rinpoche during the official long life puja. Rinpoche offered thanks to those offering practices back in August. From my heart I would like to express billions, zillions, trillions of thanks, I highly appreciate you doing practices for me. This is also puja for yourself. Even if you don’t think that it naturally happens like that as it is very powerful karma! I highly appreciate all of you being good human beings practicing the Dharma – not only wanting to achieve temporary happiness in the future but also wanting to be free from the oceans of samsaric suffering and to free all sentient beings from the oceans of suffering and for them to achieve the highest peerless happiness, enlightenment, omniscient mind. This is so important, the utmost need. Generally to live life for others, to bring happiness to others. Again my deep appreciation to all of you. The prayer flags (one of of the Long Life practices requested for Lama Zopa Rinpoche – for full details see the post dated April 24) are now ready. The prayer flags are available in strings of 25 flags,(about 8 meter long), or 10 flags per string (about 3.20 long) . The size of each flag is 30 x 50 cm. The flags and the shipping charge are free. Find a detailed description there on how to order. Delivery is by normal postal parcel and will take up to three weeks. Please note that to receive the free shipping, you have to click on ‘ Free Shipping’ in the shipping page. Please mention in the comment box of the order For express delivery, please make a donation of a minimum of 20 US$ through the PayPal link on the Kopan web site. This will cover the additional cost for express delivery of about 2 rolls of 25 flags or three rolls of 10 flags. Please add 20 US$ for each additional 2 rolls of 25, or 3 rolls of 10 flags. With many thanks to Ven Fran and the team at Kopan Monastery. Lama Zopa Rinpoche’s health still continues to improve very gradually, there is still no interest from Rinpoche’s side to do any exercise but that seems to be the way Rinpoche has chosen. At the beginning of every year I usually check with one or two high Lamas if there are any prayers or pujas we need to do to remove obstacles for Rinpoche’s health and long life. This year I have received the advice to do many prayers and pujas. These are being organized at Kopan Monastery, Sera Je Monastery, Ganden Shartse Monastery, Jangchup Choling Nunnery, Kopan Nunnery and also Ganden Jangtse Samlo Kamsen. Khadro-la (Rangjung Neljorma Khadro Namsel Drönme) is advising FPMT centers, projects, services and students to also help. I would like to support Khadro-la’s request for students and centers to do the following as much as you can so that we can continue to have Rinpoche with us for a very long time to come. Khadro la said “The most important is good samaya from the students’ side. Whoever is doing the puja, prayers or practice, it should be done well, with good motivation and meditation”. Please see the full list of pujas and practices to do below, and then please can you send in what you have done to Claire at International Office at the end of each month and we will offer that to Rinpoche. These prayers and pujas done sincerely from the heart do make a difference … please help. Tendil Nyersel prayer flags should be hung in all FPMT centers, projects and services. Kopan Monastery are kindly making these prayer flags and once they are ready (in about a month’s time) will send out information on how to order the prayer flags. (Mensaje de Roger, asistente de Lama Zopa Rimpoché. 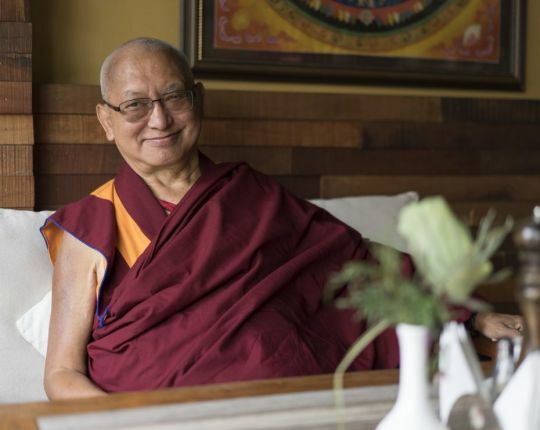 La salud de Lama Zopa Rimpoché aún continúa mejorando muy gradualmente. Rimpoché todavía no tiene ningún interés en hacer ejercicio, peroparece que eso es lo que Rimpoché ha decidido. Por lo general, a principio de cada año consulto con uno o dos Lamas superiores si hay oraciones o puyas que debamos hacer para eliminarobstáculos para la salud y larga vida de Rimpoché. Este año recibí el consejo de hacer muchas oraciones y puyas. Éstas se han organizado en elMonasterio de Kopan, el Monasterio de Sera Je, el Monasterio de Ganden Shartse, el Convento de Jangchup Choling, el Convento de Kopan ytambién [el Colegio Monástico de] Ganden Jangtse Samlo Kamsen. Khadro-la (Rangjung Neljorma Khadro Namsel Drönme) aconseja que también los centros, proyectos, servicios y estudiantes. Me gustaríarespaldar la petición de Khadro-la de que los estudiantes y los centros realicen las siguientes prácticas tanto como puedan para que podamoscontinuar teniendo a Rimpoché con nosotros por mucho tiempo. Khadro-la dijo “Lo más importante es el buen samaya de parte de los estudiantes. Quienquiera que esté haciendo puyas, oraciones o prácticas,debe hacerlo bien, con buena motivación y meditación”. Hacer estas oraciones y puyas sinceramente y de corazón sí marca una diferencia… por favor ayuden. 1. Liberación de animales: realícenla tanto como sea posible, ya sea ustedes mismos o por medio de un donativo en línea al Amitabha Buddhist Center, donde quincenalmente se realizan importantes liberaciones de animales. El texto está disponible aquí y en el Libro de oraciones, vol. 2. 2. Banderas de oración Tendil Nyersel: deben colgarse en todos los centros, proyectos y servicios de la FPMT. El Monasterio de Kopan amablemente está produciendo estas banderas de oración. Una vez que estén listas (aproximadamente dentro de un mes) les enviaremos información de cómo ordenarlas. 3. Recitar tantos mantras de Hayagriva como sea posible. 4. Ofrecer puya(s) de larga vida a Rimpoché a través de las cinco Dakinis. La FPMT le pedirá a Khadro-la que ofrezca una puya de larga vida a Lama Zopa Rimpoché. También es bueno que cuando Rimpoché visite los centros de la FPMT a lo largo del año, se le ofrezca una puya de larga vida con las cinco dakinis. 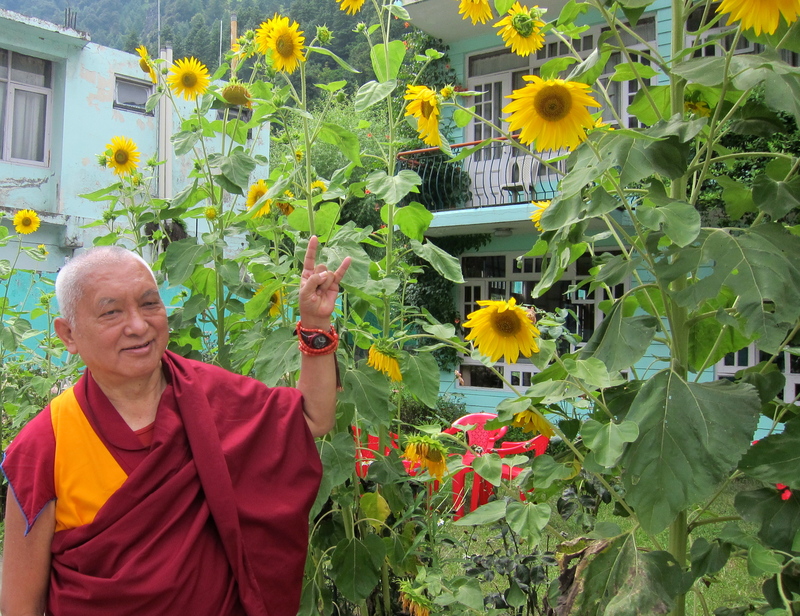 la salute di Lama Zopa Rinpoce continua a migliorare gradualmente pur non esistendo ancora un interesse da parte di Rinpoche di fare qualsiasi esercizio tra quelli prescritti… ma questa sembra essere la via che Rinpoche ha scelto. All’inizio di ogni anno, di solito controllo con uno o due grandi Lama se ci sono delle preghiere o puje che dobbiamo fare per rimuovere gli ostacoli alla salute e alla lunga vita di Rinpoche. Quest’anno ho ricevuto il consiglio di fare molte preghiere e puje. Queste sono state organizzate al Monastero di Kopan, di Sera Je, Ganden Shartse, Jangchup Choling Nunnery, a Kopan e anche a Ganden Jangtse Samlo Kamsen. Khadro-la (Rangjung Neljorma Khadro Namsel Drönme) consiglia ai Centri, Progetti e Servizi FPMT e anche agli studenti di impegnarsi anch’essi in queste pratiche. Vorrei quindi appoggiare la richiesta di Khadro-la agli studenti e ai Centri di fare quanto è possibile in modo di continuare a beneficiare della presenza di Rinpoche per molto tempo a venire. – Appendere le bandiere di preghiera Tendil Nyersel in tutti i centri FPMT, progetti e servizi. Khadro la ha aggiunto “La cosa più importante è mantenere buoni i samaya (impegni) da parte degli studenti. Chi sta facendo le puje, le preghiere o le pratiche, dovrebbe farle bene, con una buona motivazione e buone meditazioni “. Si prega di consultare l’elenco completo delle puje e pratiche da fare al link sotto indicato, e poi per favore potete inviare quello che avete fatto a Claire presso l’Ufficio Internazionale FPMT alla fine di ogni mese in modo da poterle offrire a Rinpoche. Queste preghiere e puje fatte sinceramente dal cuore fanno la differenza …Vi preghiamo di aiutare in tutto questo. La santé de Rinpoché continue de s’améliorer très progressivement. Rinpoché ne montre toujours pas d’intérêt pour faire des exercices mais cela semble être ce qu’a choisi Rinpoché. Habituellement, au début de chaque année, je vérifie avec un ou deux grands lamas s’il y a des prières ou des pratiques à faire pour lever les obstacles à la santé et la longue vie de Rinpoché. Cette année, ils m’ont conseillé que soient faites de nombreuses prières et poujas. Celles-ci sont organisées dans les monastères de Kopan, Séra Djé et Ganden Shartsé, dans les nonneries de Jangchoup Choling, Kopan et également à Ganden Jangtsé Samlo Kamsèn. Khadro-la (Rangjoung Néljorma Khadro Namsél Drönme) conseille également aux étudiants, centres, projets et services de la FPMT d’apporter leur aide. Je souhaite exprimer mon soutien à la demande de Khadro-la d’effectuer les pratiques suivantes aussi souvent et autant de fois que possible afin que nous puissions garder Rinpoché près de nous pendant encore très longtemps. – offrir à Rinpoché des poujas de longue vie avec les 5 dakinis. Vous trouverez ci-dessous la liste des poujas et pratiques. S’il vous plaît, veuillez indiquer chaque mois à Claire, au Bureau international, celles que vous avez faites et nous les offrirons à Rinpoché. Ces prières et ces poujas faites du fond du coeur font vraiment une différence. S’il vous plaît, apportez votre aide. 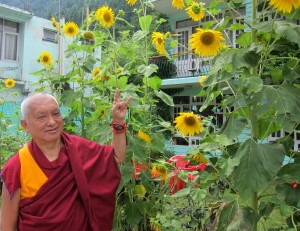 Lama Zopa Rinpoche’s health is good. The doctors seem satisfied with the blood pressure and sugar levels. Over the past couple of months Rinpoche hasn’t exercised as much (due to the busy schedule) so that has been disappointing and so not any noticeable improvement in the walking action. Now in Nepal Rinpoche has started again to do circumambulations of the stupa, which is very good and I hope this continues regularly while here. While in India Rinpoche attended an Ayurvedic clinic for 7 days, this seemed to help his health in a general way. The doctor wanted Rinpoche to attend a full treatment program which would be for 21 days. Rinpoche was very reluctant to do for that length of time. The doctor there and the staff were very good. Maybe sometime in the future this can happen. Rinpoche’s speech in Tibetan is very clear, His Holiness Ling Rinpoche made this comment as well as other Lama’s. English language is also clearer. Yesterday we have finished 1020 times the sixteen arhat pujas (about 920 were done by the monks). We started immediately after the Chenrezig retreat with Khadro-la, and it took us almost two weeks of mostly five daily sessions. We recited the Panacea of Pure Nectar and long life prayers for His Holiness and Kyabje Zopa Rinpoche after almost every session. It was very nice and an honour that we could do it for Rinpoche’s health. Hope Rinpoche will fully recover very soon, and we hope He might be able to teach again as much as He wants, in the way that He wants and wherever He wants. And of course we hope He will have a very long life, and that we may be able to fulfil all His wishes. Rinpoche is doing well, progress is still slow but seems normal for this situation. The main thing is that there is still progress. Rinpoche is more independent, using the right hand more and the right leg is stronger we just need to focus on getting the action more correct. Rinpoche’s speech is very clear when speaking Tibetan, in English if he doesn’t make effort there is a slight slur. But when teaching and Rinpoche focuses on the pronunciation it is clear. Blood pressure and sugar levels are good for Rinpoche’s situation, and the doctors are pleased. Long term Rinpoche doesn’t want to have to take western medicine if possible, so in the long term we have to find other methods combined with a good lifestyle!